The image suffers from various types of defects such as surface scratches, discolorations and details fading. - Replace missing and faded parts. The first thing we're going to do is reducing major scratche. Select Magic Wand Tool and click on the white area to get a selection. Soften the edge of a selection using the Feather Command. Apply the Curves (Ctrl + M ) to fill a damaged area with color like background. 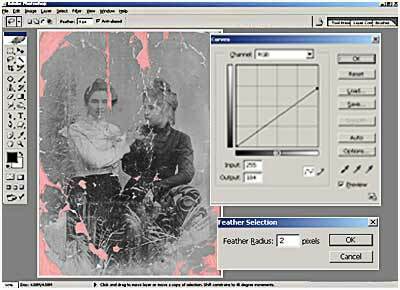 The basic removal method described in many guidance and consists in selectively Using the History Brush after applying the Dust & Scratches filter to an entire image . This method is great for fix minor flaws. However this image suffers from various types of defects and damage size is commensurate with the size of the important detail. So filter effect will be destructive : the worst scratches will not be eliminated and important details will be destroyed. 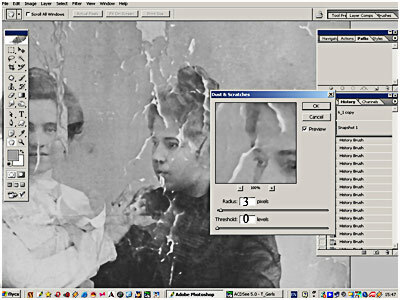 For the decision of this problem we will align the the critical areas with the Cloning Tool after applying the dust and scratch filter and before applying the History Brush. The combination of these tools allow to remove the scratches and restore the surface without additional softening/ blurring to maintain maximum detail. For better results we will apply sequence of actions for each important part of the photo. At first, we will fix the girl's face. 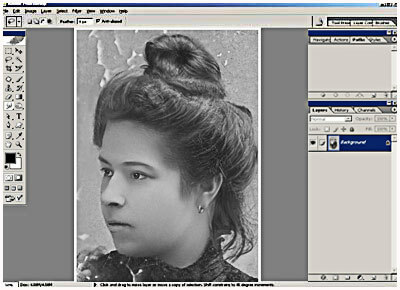 Set last action as source for the History Brush , click on the Snapshot 1 is placed at the top of the History Palette and start painting on the image. -To fix the eyes, lip and nose we use a Bbrush, Burning and Finger Tools. Similarly repeat the steps for the rest of the detail. Fix background image and add sepia tone.  To reduce the amount of correction work we will partially restore the original background. 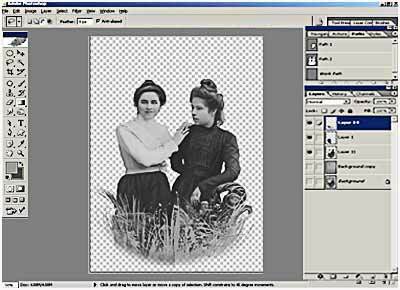 Cut image and move one on the studio background from clipart. 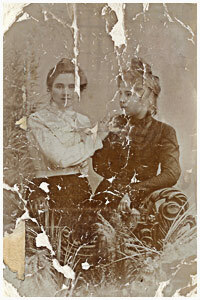 Add a sepia tone to the image and and view result.